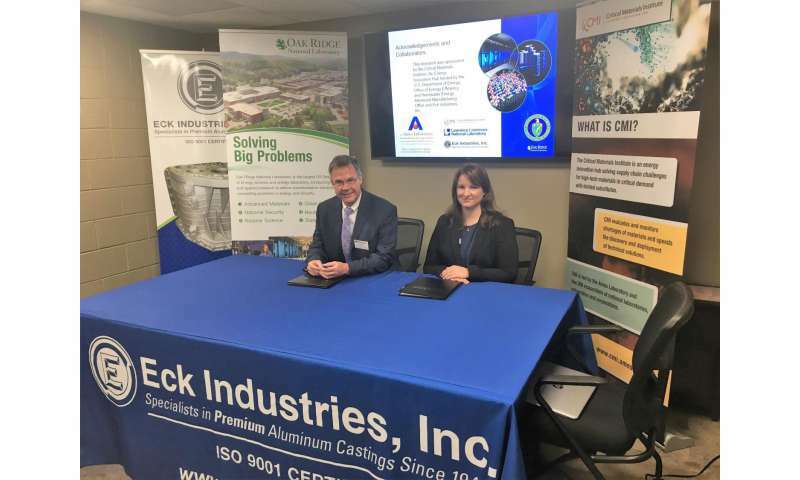 Wisconsin's Eck Industries has signed an exclusive license for the commercialization of a cerium-aluminum (Ce-Al) alloy co-developed by the Department of Energy's Oak Ridge National Laboratory that is ideal for creating lightweight, strong components for advanced vehicles and airplanes. The patent-pending alloy was developed as part of DOE's Critical Materials Institute (CMI) and makes use of cerium, the most abundant rare earth element. Cerium makes up as much as half of mined rare earths, yet has less value than co-mined elements like neodymium and dysprosium that are in high demand for advanced energy technology applications. Creating new uses for cerium supports both domestic rare earth mining operations and the US manufacturing sector. Scientists at ORNL, working with Eck Industries and researchers at DOE's Ames and Lawrence Livermore national laboratories, developed the Ce-Al alloy that is easy to work with, lightweight, corrosion-resistant, and exceptionally stable at high temperatures—making it ideal for automotive, aerospace, power generation, and other applications. "The alloy is thermodynamically stable," Rios said. The cost of heat treatment and the additional machining required due to thermal distortion can make up some 50-60 percent of the cost of casting traditional alloys. Energy costs could potentially be reduced by 30-60 percent compared with traditional casting processes, he noted. 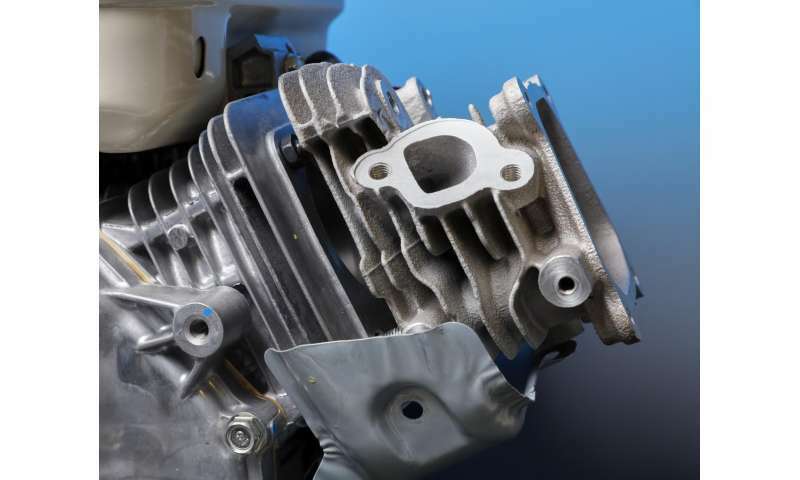 The Ce-Al alloy's potential marks a significant departure from post-casting heat treatment and age-hardening approaches developed over some 100 years and can significantly advance manufacturing competitiveness as result, Rios added. Alan Liby, director of ORNL's Advanced Manufacturing Program, said, "The breakthrough properties observed in this innovative alloy will enable greater manufacturing energy efficiency and new energy-efficient products." "There has been tremendous interest from industry due to the unique material properties and low cost of this alloy," said David Weiss, vice president of Engineering/R&D at Eck. "This project is a template for rapid development and commercialization. Not only did we bridge the research 'valley of death,' we also developed a highway for communication from our customers to us to help guide the project." The involvement of multiple national laboratories and industry via CMI's interest in leveraging scientific knowledge to help solve critical materials issues was essential to fast development of the alloy. ORNL researchers led the development team while focusing on casting and microstructure property stability. Ames ran experiments on thermo-mechanical processing and examined the thermo-physical properties of the Ce-Al alloy. Lawrence Livermore performed characterization work using advanced microscopy and other methods. Eck was involved in pilot-scale experiments and provided manufacturing insight and expertise. CMI's strategy is to bring together industrial, academic, and national lab expertise to address US reliance on critical materials like rare earth elements that are essential to energy, defense, and other manufacturing sectors. "It's tough for a mine to survive if half of its output has no market. This alloy creates a use for the cerium that accompanies scarce and critical rare earths like neodymium and dysprosium," said CMI Director Alex King. Perhaps if we pursued room temperature internal combustion we wouldnt need such exotic materials. "Stable and reproducible spontaneous self-ignition and self-supporting combustion have been achieved at room temperature by exposing nanometer-sized catalytic particles to methanol/air or ethanol/air gas mixtures. Without any external ignition, structurally supported platinum nanoparticles instantaneously react with the gas mixtures. The reaction releases heat and produces CO2 and water. Such reactions starting at ambient temperature have reached both high (>600 °C) and low (a few tenths of a degree above room temperature) reaction temperatures. The reaction is controlled by varying the fuel/air mixture. Catalytic activity could be dramatically changed by reducing particle size and changing particle morphology."